Sensational. But let me add: Full Disclosure—I’m not on the “Viognier is all” vogue train. It’s the be all end all for some but it’s also, often, patently dull. Not this stunning white from La Frenz in Naramata. The La Frenz sips well, very well, and better yet was superlative with food, has exceptional generous fruit, and is just one of those perfect, social wines without pretense or affectation, yet with incredible intensity and flavour. It reminded us of a lovely summer Muscat we also loved and reviewed here. Dinner? 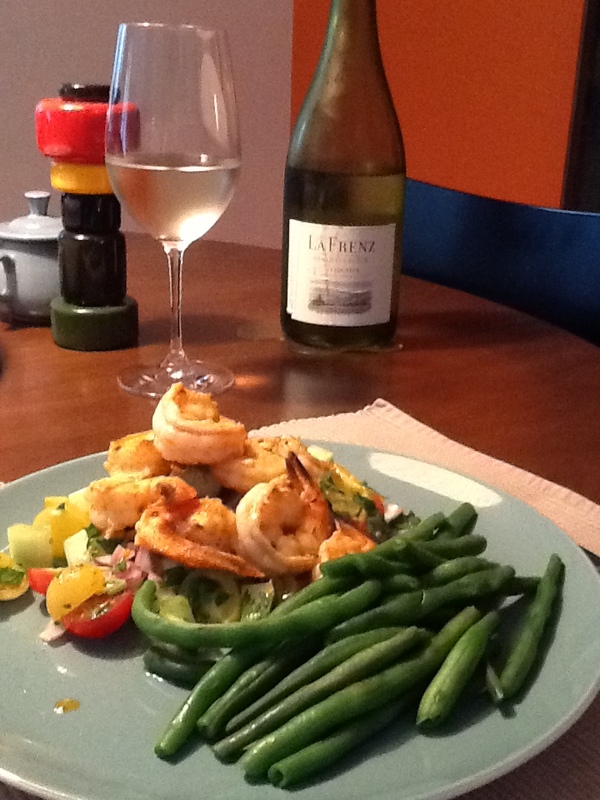 We drank it with harissa-marinated shrimp on a salad of summer cherry tomatoes, cucumber, Italian parsley and red onion. Superb, Taylor and Burton on a good day. If you could bottle this and sell it, by god you’d be rich! The downside? I didn’t order much as I’m not (generally) a Viognier fan and then the next thing you know it’s sold out and probably the only place I’ll see it is in a restaurant at the groan-inducing price of $45 or more… Many medal wins of course. Price: $22 from the vineyard. Market Liquidity: Astonishingly good value. 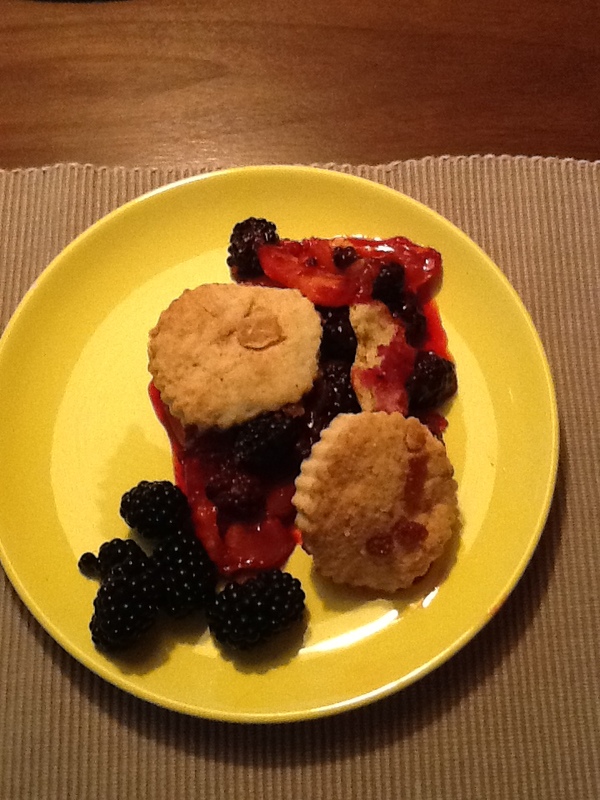 Dessert, a fresh nectarine blackberry cobbler with ginger cinnamon crust, wasn’t too shabby either. Surprisingly good value. Sometimes in the lower priced chards you get hit over the head with a thwack of oak; not here. It’s got oak, but not “lynn-dee-min” oak, if you know what I mean. Lots of apple, pear, OK balance and a buttery flourish. Was a treat with Tuscan melon and prosciutto and some fresh yam gnocchi. Sure, it’s not fine Burgundy, and faces stiff competition in its class, but at the price point this is exceptional value. Not to be confused with Vosne-Romanée Pré de la Folie! Price: $15.50 USD on a whim while in the US. Market Liquidity: We liked the change in our pocket. Naramata Malbec. Hmmm. Sounds like an oxymoron. But this La Frenz offering is in fact an honest to god Malbec; has a pungent toasty tannic kick and appealing fruit finish. As a sipper: So so. It just didn’t rise to the occasion the way so many Argentinean Malbecs do (and, for better or worse, many rise higher in the $19-23 price range). With food it was much finer. A mixed grill—lamb, beef, buffalo—was the perfect pairing, best with the buffalo but great all round. More spice, depth, berry, less chalk. Price: $25 from the vineyard; not in BC Liquor stores. Market Liquidity: Like a good movie that you only need to see once. Blackberry, chocolate and a tangy peppery bite that in an odd way could be described as crisp. Not as “gentle” or forward and approachable as umpteen Califonia Zins. With food it drank much better than a sipper. On one night we had it with hamburgers and it was OK, not brilliant. We had the rest the next night with a simple peasant dish (spicy Italian sausages, leftover ciabatta cubed, sliced fingerling potatoes, rosemary stalks, a little paprika, all tossed in some olive oil, baked for 45 minutes), with fresh vegetables. It came alive with a strong, spicy meat as if adolescent to adult; it was like the flip side of Ruby Tuesday (which was, for those too young to remember 45s, Let’s Spend the Night Together, faster, louder, and much more “Stones” than the Beatle-ish RT). Had a nice finish, plum, berry, vanilla and creme de cassis. We liked the Marietta, but we didn’t love it. At the US price, under $20, an exceptional value. NB: Been around since 1974 but not listed in Hugh Johnson’s pocket wine guide; pity. Price: $19.99 USD in WA, not available in BC. Market Liquidity: Take that Ravenswood! 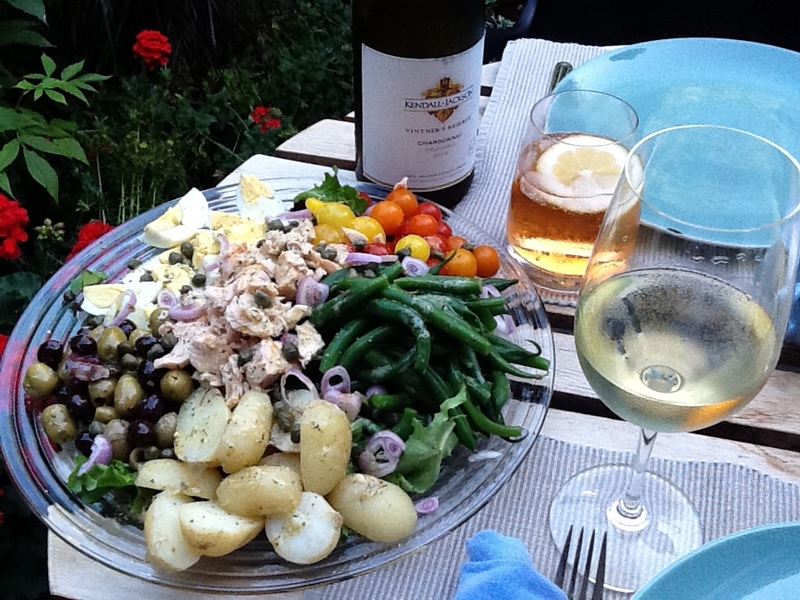 For a fresh and summery salade nicoise, I reached into the fridge for a bottle of Sauvignon Blanc only to discover there was nothing but chardonnay and sparkling water! Some preparation. The Kendall Jackson is a pleasant sipper, not overbearing or too rich, some minerality and acid and hints of something greater which the label would have you believe you’d find but we were at a loss. As chardonnays go it’s versatile and, I don’t know how to put this except bluntly: Inoffensive. It isn’t bad, it just doesn’t rise to the occasion. But now and again it’s a handy fallback. 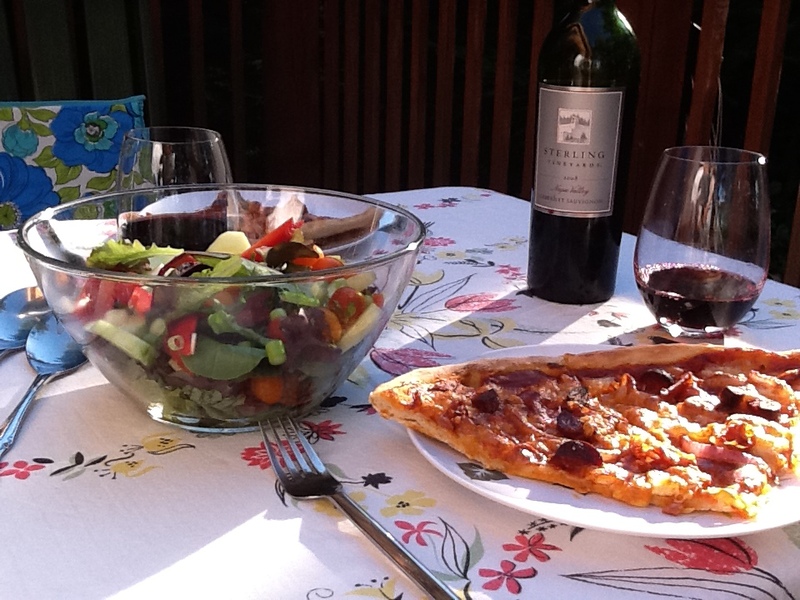 It was, however, absolutely the wrong wine for olives, capers, tuna, lemon Dijon dressing, etc. With a little air and time out of the fridge there is a mellowness which makes it a tad more appealing. Price: At $24 at BC Liquor, overpriced, but around $15 USD in WA, a sure bet. Market Liquidity: Good effort, no podium. It sometimes alarms me how much good wine we drink. But then again that must be testament to how many great wines there are still to discover. And I think, for those who like wine, who like to enjoy food and wine, who take a glass with friends, who lean towards the variety and depth and phenomenal nuance of wine, it is probably a great joy to open just another bottle and discover something wonderful. The Sterling isn’t a much lauded Bordeaux vintage and I have no idea (or inclination to find out) what Mr. Parker deemed it on his ten point scale which begins (ironically?) 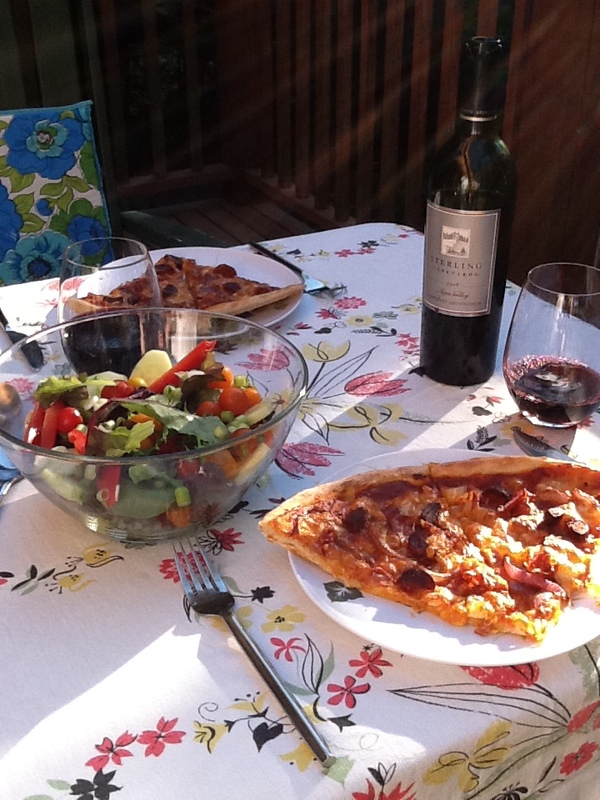 at 85, but this is perfectly palatable, smooth and eloquent, a smidgen strong as a sipper (it is after all a Cab Sauv) but with a picnic mid-summer dinner of Jim Lahey’s homemade thin crust pizza and salad, it was dreamlike. Soft and peppery, dry and fruity, oak but not much, just as warm and peaceful as the August setting sun. It may have been more appropriate with a fine cut of red meat but we found it delectable and luscious in our circumstance and too bad there was only one bottle. Even at the nearly $30 Canadian threshold, we liked it enough to cough up the dough. But under $20? You must be joking. 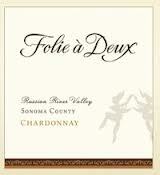 Price: $19.99 USD in Washington for the 08, other vintages (e.g., 09) $28.99 at BC Liquor. Market Liquidity: It’s a peaceful easy feeling. Please sir, may I have some more? Yes, but you will have to source it at a private wine store and pay double what you pay in the US. That is unfortunately the wine business in BC. But this wine is unquantifiably satisfying and worth the search. Deceptively simple nose but myriad levels of flavours and nuance on the palate. Most delectable is the last note of butterscotch on the finish, a light lingering finish you don’t anticipate. It seemed to bridge the not so easy to achieve balance between the broad, strong, typical California chards (i.e., cheaper) with the more austere, mineral dominant chards of note, such as Montelena (i.e., more expensive), and that balance just seemed perfect. 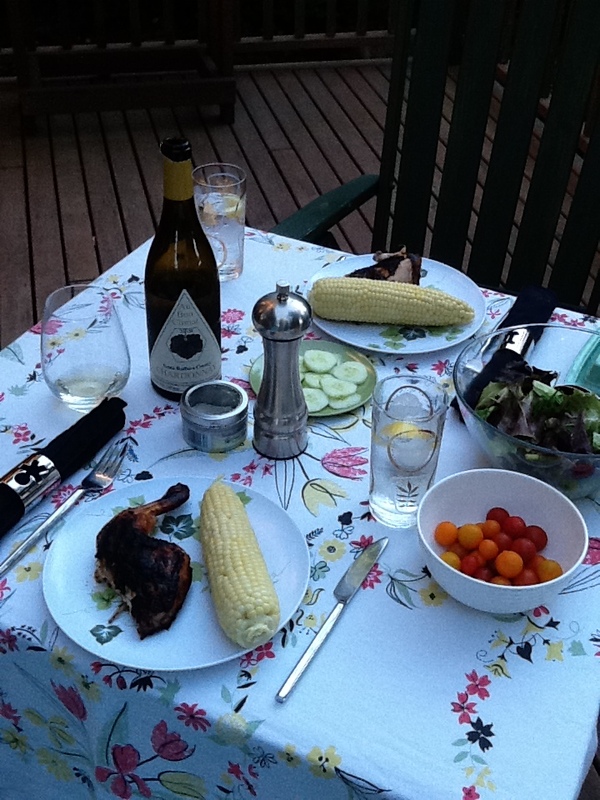 However, maybe we liked this wine so much because we had it on the deck, on a perfectly warm and still August evening, a gorgeous marinated BBQ chicken, the first of the fresh corn, local cherry heirloom tomatoes, and not a wasp in the mix! Context may have skewed how much we loved it, but my notes indicate that it was superlative and I have to stand by that. And I do! Price: Less than $20 in the US but $36 in Vancouver at Marquis (but thank god someone has the good sense to stock it). Market Liquidity: Everything a chardonnay should be. From the cellar: A beautiful red, a beauty of beauties. 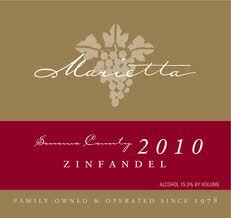 A blend of primarily Zin rounded out with a hodgepodge of other grapes (four per cent Mataro?) which results in just shockingly good balance and scrumptious, forward fruit. A slight piquancy keeps the cherry cola notes from overpowering and becoming cloying and sweet. 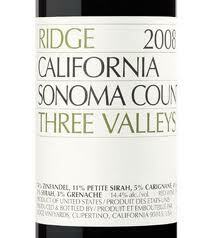 My god do they turn out some fine wines down at Ridge. Someone knows what they are doing and is doing it very well; and to think this is just one of their more “average” bottles. You could sip this all night without a nosh and be nothing but satisfied but we did end up serving it with a dry aged NY strip, BBQ, no adornment, and the Three Valleys was just shy of being up to the challenge. Belmont and Preakness yes, no Derby. The label claimed it was ready from the get go upon the 09 release; I picked up this specimen at Pete’s in Seattle on holiday in early 2010 and sat on it for nearly a year and a half. It opened up beautifully and without an ounce of disappointment. Shockingly good value in the US but, alas, Ridge in BC is rare, pricey and difficult to justify the after tax expense. So, like a week in Hawaii in the dead of winter, it was an isolated indulgence. Price: $19.30 USD at Pete’s in Seattle in 2010.